Set on the American Gulf Coast, Nailer works light crew. His dirty, dangerous job is to crawl deep into the wrecks of the ancient oil tankers that line the beach, scavenging copper wire and turning it over to his crew boss. 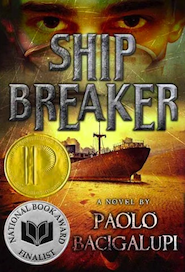 After a brutal hurricane passes over, Nailer and his friend, Pima, stumble upon the wreck of a luxurious clipper ship. It’s filled with valuable goods –a “Lucky Strike” that could make them rich, if only they can find a safe way to cash it in. Amid the wreckage, a girl barely clings to life. If they help her, she tells them, she can show them a world of privilege that they have never known. But can they trust her? And if so, can they keep the girl safe from Nailer’s drug-addicted father?